This post is sponsored by Tumbleweed Texstyles. Founded in Frisco, based in Frisco, and now a collection focused on Frisco. Owners Brian Wysong and Jeb Matulich are local residents. They live here in Frisco, raise their kids here, work here, go to church here, and thus spend the majority of their time in the community they’ve both grown to love. Sure, Texas takes the cake. Tumbleweed TexStyles is well known for Texas pride t-shirts but there’s always been a clamoring of requests to get more local and show some love for Frisco. With our store opening in 2019, we decided it was time to launch added Frisco designs to best serve our community and customers. Our design team has an archive of Frisco designs that we’ve created over the years, with many dating back to 2012. It is time for us to unravel those for people to enjoy! We have the inside scoop on the new designs. 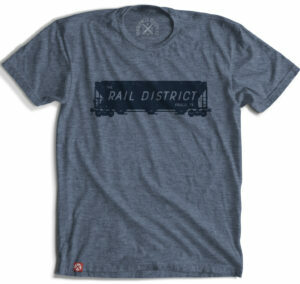 Let’s just say Wysong and Matulich had a “Nack” for collaborating to bring Frisco’s Rail District into the collection. The design is a nod to the new and improved downtown, which brings the old and the new together to honor Frisco’s history. Social butterflies will recognize a design back by popular demand – the Frisco Socialite tee. It may look simple but it says a lot! One of our instant new favorites is the vintage Frisco shirt. Six unassuming letters with a rugged, authenticity that beckons an old soda fountain or filling station mood. The growth of Frisco and the increased pride within our community is what inspired Brian and Jeb to offer cool designs for locals. They want people to be able to wear their designs with pride when crossing the borders to surrounding communities and, of course, to wear around town. You may have already seen one of Tumbleweed’s Frisco designs that are back in the lineup, perhaps the iconic Frisco logo, a licensed mark owned by BNSF Railway Company. Not to worry though, Tumbleweed TexStyles has been approved by the BNSF Railway Company to sell the Frisco logo in selected colors. Because Tumbleweed TexStyles was founded by two Frisco ISD teachers, the roots of the business are in Frisco, and the pulse of the company is education. Frisco is home to Brian and Jeb, and thus Frisco will be home to the flagship store, by design. The men attribute their business success and growth to the amazing support from co-workers in Frisco ISD and to their friends and neighbors. We love the education of our community. We believe that is the backbone to our community and the catalyst to the growth Frisco is experiencing. We love the entertainment, food, sports and most importantly the diversity of people. Vibe, attitude, mood, style. What is it about the look that we love about Tumbleweed’s tees? This newest collection, consisting of eight designs initially, may be described as a lifestyle. Wysong says he’s not sure if there is one best way to describe the Frisco Collection. Ultimately, it will be based on the lifestyle and possibly humor that people of Frisco get and understand. The Frisco Collection has creativity, some humor, food and drink pride, it’s family friendly, and has a connection to the sports and typical concepts for life in the burbs. We also want to tap into the history of Frisco and create some more vintage Frisco-inspired designs. Designs in the Frisco Collection will slowly launch throughout the remainder of 2018 and into 2019 as we build up to the grand opening of Tumbleweed’s flagship store downtown. This isn’t your typical shop either. Part of Nack Development’s “The Patios at the Rail” at South County and Main Street, this highly anticipated renovation of the Rail District will capture the city’s culture and history in the heart of Frisco. We don’t have to wait a year until The Patio’s location is stocked and open for business. You’ll be able to shop Tumbleweed’s launch of the Frisco Collection online and at the Frisco Mercantile. When you find yourself strolling the sidewalks of Merry Main Street in December, you can do some shopping there as well to get a few more stocking stuffers and gifts checked off your list. Use code LIFESTYLE20 for 20% off! The best way to follow the launch of Tumbleweed TexStyles‘ new designs and see behind the scenes information is to follow their active Instagram feed, Facebook and Twitter pages. I love your t-shirt designs… is there anyplace to purchase them?